LaceKnits, a brand-new eMag, is here—and bursting with exciting techniques, how-to articles, and gorgeous patterns to entice knitters of all levels. LaceKnits is available in the iTunes store for download on the iPad. Here's a preview of all the lacy goodness this issue has to offer. Carol Feller designed the Aileron Shawl, a wonderful heart-shaped shawl created by working just two more increases per row on a basic triangle. 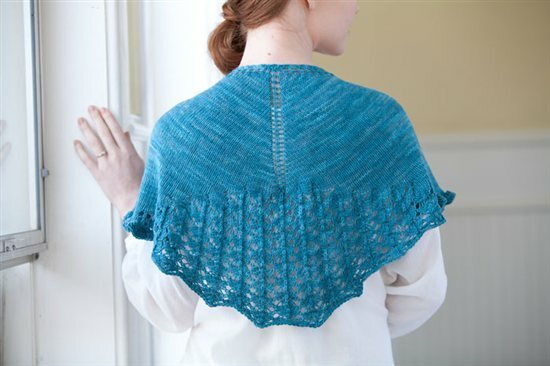 The shawl is finished off with a flourish of lace and ruffles. Finished Size About 44" wide and 201/4" tall at center. Yarn Blue Moon Fiber Arts Socks That Rock Lightweight (100% superwash merino; 360 yd [329 m]/127 g): Ramalaba, 1 skein. Needles Size 7 (4.5 mm): 32" circular (cir). Gauge 16 sts and 30 rows = 4" in St st, blocked. The Severn Shawl by Laura Nelkin is a unique modular triangular shawl built in pieces: two mirrored right triangles are knitted individually, then joined with a symmetrical center panel. The stitch pattern alternates balanced increases and decreases with four-stitch cables, creating fluid yet structured fabric. Finished Size 72" (1.8 m) wide and 28" (71 cm) deep at center point; center panel is 8" (20.5 cm) wide. Yarn Zitron Filisilk (70% extra fine merino, 30% silk; 656 yd [600 m]/31/2 oz [100 g]): #3009 celery, 1 skein. Needles U.S. size 5 (3.75 mm): Two 24" (60 cm) circulars (cir). Adjust needle size if necessary to obtain the correct gauge. Notions Tapestry needle; waste yarn. Gauge 24 sts and 32 rows = 4" (10 cm) in St st, unblocked; 20 sts and 32 rows = 4" (10 cm) in Center Panel chart patt, blocked. Rebecca Blair's Madder Stockings were inspired by the Ivory and Madder Bridal Veil, which showcased Shetland lace knitting at the first World's Fair in 1851. The shawl's edging is transformed into the cuff of these stockings, and the zigzag insertion travels down the front of the leg. Finished Size 81/2 (93/4, 103/4)" (21.5 [25, 27.5] cm) calf circumference; 6 (63/4, 71/4)" (15 [17, 18.5] cm) foot circumference (see Notes). Foot and leg lengths are adjustable. Socks shown measure 81/2" (21.5) leg circumference and fit a U.S. women's shoe size 8. Yarn A Verb for Keeping Warm High Twist (70% merino, 30% silk; 660 yd [604 m]/31/2 oz [100 g]): transnational fury, 1 skein (see Notes). Needles U.S. size 1 (2.25 mm): set of double-pointed (dpn). Adjust needle size if necessary to obtain the correct gauge. Notions Waste yarn; markers (m); tapestry needle; T-pins. Gauge 38 sts and 50 rnds = 4" (10 cm) in St st; 42 sts and 48 rnds = 4" (10 cm) in back patt. Heather Zoppetti's Clematis Tunic begins at the lower edge with graceful leaves, which climb toward the front collar and transition into a lace mesh. The waist shaping follows the shaping of the leaf motif for a seamless fit. Finished Size 331⁄2 (373⁄4, 42, 461⁄4, 501⁄2)" (85 [96,106.5, 128.5] cm) bust circumference, buttoned. Vest shown measures 331⁄2" (85 cm). Yarn Classic Elite Soft Linen (30% baby alpaca, 35% wool, 35% linen; 137 yd [125 m]/50 g): #2206 thistle, 6 (7, 8, 9, 10) balls. Needles U.S. size 5 (3.75 mm): 16" (40 cm) and 32" (80 cm) circular (cir). Adjust needle size if necessary to obtain the correct gauge. Notions Marker (m); stitch holders; tapestry needle; six 1⁄2" (1.3 cm) buttons. Gauge 221⁄2 sts and 32 rows = 4" (10 cm) in patt st. 24-stitch repeat of Chart A = 41⁄4" (11 cm) wide, blocked. Donna Druchunas's Linas Scarf was inspired by a pair of summer socks. Flax growing and linen production touched every part of life in the Lithuanian countryside, and linen was used there even for footwear. The strong diagonal lines of the lace pattern are echoed in the shaped ends, which are finished with playful braided tassels. Finished Size 8" wide and 64" long, without tassels. Yarn Quince & Co. Sparrow (100% organic linen; 168 yd [155 m]/50 g): natural, 3 skeins. Needles Size 3 (3.25 mm): straight. Adjust needle size if necessary to obtain the correct gauge. Notions Markers (m); tapestry needle; size J/10 (6 mm) crochet hook. Gauge 28 sts and 32 rows = 4" (10 cm) in St st.
Find these patterns and more—interviews, technical articles, reviews, and charted lace motifs—in LaceKnits. Enjoy!